ORF Members are people who feel it is important to preserve our past as a way of creating meaingful continuity through time with our community and our environment. Oysterville is not a museum or theme park, but a vital community rooted in history and planning for the future. 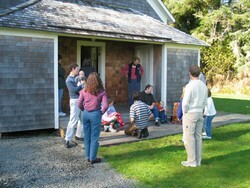 Anyone can become a Supporting Member of the Oysterville Restoration Foundation. People who own property within the National Historic District can become Voting Members. Voting Membership dues are $30 per person. Note: there is a limit to 3 voting members per household. Supporting Membship dues are $30 per household. Click here to download a PDF version of the ORF Membership Form. Our Annual Membership Meeting is held Memorial Day weekend and is open to the public.